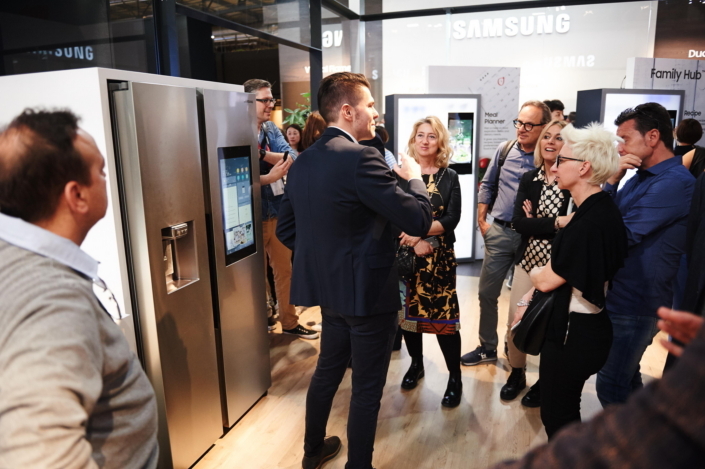 Samsung Electronics today announces its first participation in the biennial EuroCucina 2018 in Milan, as part of its commitment to strengthening its presence in the European market. Samsung’s exhibit aims to elevate the company’s brand image and reputation among consumers in the region with products that make a real difference to consumers’ lives. Samsung is introducing its full built-in product lineup at EuroCucina, and among the range of unparalleled kitchen solutions is the brand new Dual Cook Flex™ oven. Its EU-industry-first innovation “Flexible Door” gives consumers independent access to the upper oven compartment without losing heat and compromising cooking performance in the lower compartment. The upper and lower compartments can even be used as one bigger compartment for large dishes by removing the divider. Dual Cook Flex™ offers a range of smart features for optimized cooking. For example, consumers can conveniently start preheating the oven and remotely monitor and control cooking conditions while on the go via the SmartThings app. In addition, the Cooking Guide recommends the best cooking mode, temperature, and cooking time based on the ingredients and type of food being made. As part of Samsung’s presence at EuroCucina, there will be demonstrations of how key home IoT products work together seamlessly. Samsung plans to maximize its smart/IoT leadership by providing customized smart solutions. Visitors will be able to experience Samsung’s unique home IoT technologies through Family Hub and its smart built-in offerings. On display will be the superior smart connectivity of the Dual Cook Flex™ and the latest generation of Family Hub™ that is integrated with SmartThings. Family Hub™ gives consumers an easy, convenient and harmonized experience for connecting all smart devices in the home, with features like Bixby, Meal Planner, Shopping List, and Recipes that provide real life smart experiences in the kitchen. At the Samsung booth, visitors will be able to experience and understand the company’s unique kitchen technologies. This includes the WaterWall™ dishwasher that perfectly cleans all dishes from corner to corner, and Virtual Flame™ cook top, which provides the intuitive visual control of flames. Samsung’s Twin Cooling Plus™ technology will be showcased as well, in a transparent display to exhibit how the system controls the refrigerator and freezer independently. In addition, Samsung’s premium designs will also be on display, including flat design, a minimalist design that seamlessly harmonizes all lines into one and maximizes usability. Samsung also displays its black stainless-steel built-in package and Dacor’s Modernist collection. To further demonstrate Samsung’s innovative and smart appliances, Samsung will host a launch conference for partners and media on April 18th at the Auditorium of Salone del Mobile and an exclusive Samsung Club des Chefs cooking show the same day, led by Michelin-starred chefs at the Samsung booth in Hall 15. EuroCucina, and its ancillary Technology for the Kitchen Event, runs as part of Salone del Mobile Milano from April 17th to the 22nd.